An unprecedented ‘desi’ wave hit the United States general elections as a record number of four Indian-Americans were on Wednesday elected to the US Congress, while the fifth candidate’s election results have gone for recounting. Indian-American women put up a good show in the 2016 elections, with Kamala Harris, 51, a two-term attorney general from California, creating history by winning the US Senate seat from the state. Pramila Jayapal, 51, won the Congressional seat from Seattle to enter the House of Representatives, the first Indian-American woman to accomplish this feat. Jayapal would be joined in the House of Representatives by Raja Krishnamoorthi, who made it to the highest citadel of democracy in their second attempt. Ro Khanna, the democratic candidate from California’s 17th District, defeated his party colleague Mike Honda by nearly 19 percentage points. Meanwhile, Democratic Congressman Ami Bera’s election results have gone for recounting. Bera was contesting against Republican Scott Jones for the House of Representatives. “I have full confidence that the professionals who work at the Sacramento County Registrar will ensure that every ballot is counted, and right now we need to let them do their job,” said Bera. “As the first votes were counted on Election Day, I had the greatest lead I've ever had at this stage, so I’m confident that we're again headed toward victory. After months of a divisive national election, our job starting tomorrow is to bring our country back together,” he said. In 2012, and again in 2014, Bera's race was too close to call on election night. In both years, Bera emerged as the winner -- in 2012 by a margin of 9,191, and in 2014 by a margin of 1,455 votes -- after the Sacramento County Registrar of Voters counted these provisional and vote by mail ballots. If re-elected for the third term, Bera would equal the record of Dalip Singh Saund, who was elected to the House of Representatives from the 29th Congressional District of California from January 1957 to January 1963. Jindal, who later went on to become the two-term Governor of Louisiana, was elected to the US House of Representatives twice in 2004 and 2006. Outgoing US President Barack Obama had endorsed Harris, Krishnamoorthi and Bera. Senator Bernie Sanders and former US President Jimmy Carter had endorsed Jayapal. 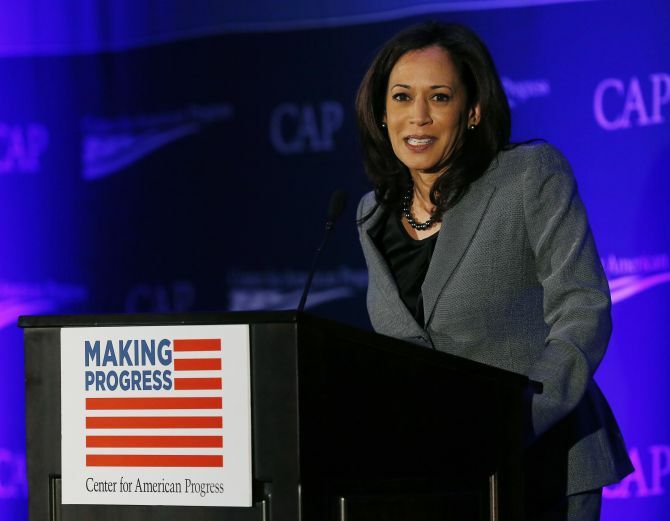 Harris, who was born in Oakland, California, is the daughter of an Indian mother who emigrated from Chennai in 1960 and a Jamaican American father. California Democrats had overwhelmingly endorsed Harris for US Senate, solidifying her front-runner status in the race to become California’s next senator. Endorsing Harris, Obama had said "Kamala Harris fights for us. That’s why I am so proud to endorse her for United States Senator. And if you send her to the Senate, she'll be a fearless fighter for the people of California, all the people of California, every single day." Jayapal entered the US Congress in her maiden attempt. Born in Chennai, she left India at the age of five for Indonesia, Singapore and eventually for the US. Jayapal says her life transformed for the better after she spent some time in India when she returned to the country after a gap of 25 years in April 1995. Her book -- Pilgrimage to India: A Woman Revisits Her Homeland -- was published in 2000. In the primaries, early this summer, Khanna had received more votes than eight-term incumbent Honda. California electoral system allows the top two winners of the primaries to proceed to the general polls, even if they are from the same party. Khanna, 40, had narrowly lost to Honda in 2014 Congressional polls. A Yale law graduate and a former official of the Obama administration, Khanna was pitted against his own party’s Honda to represent the 17th Congressional district of California, whose residents stretch from Tesla Motors factory in Fremont to Apple's headquarters in Cupertino -- taking in Intel, Yahoo, and eBay along the way. Krishnamoorthi, 42, was contesting for the 8th Congressional District of Illinois that includes west and northwest Chicago suburbs. A son of immigrants, Krishnamoorthi grew up in Illinois and after college and law school, he became policy advisor for Obama’s successful US Senate campaign. He also served as a founding prosecutor in Illinois Attorney General Lisa Madigan’s anti-corruption unit. In an endorsement in June, Obama had said as the son of immigrants who worked their way into the middle-class, Krishnamoorthi understands both the challenges facing America’s working families and the opportunities their work makes possible. “I know he'll fight hard in Congress to create more good jobs, empower more Americans to start businesses, and help working families afford to put their children through college,” Obama had said. Two Indian-Americans in fray from New Jersey and Michigan however lost their bid to enter the US Congress. Democratic Party candidate in New Jersey’s 7th congressional district Peter Jacob lost the race to Republican party’s Leonard Lance, who got 55 per cent of the votes. Jacob came in a close second garnering 42 per cent of the votes. In Michigan’s 11th District, Democratic Party candidate Anil Kumar lost the race, getting 40 per cent of the votes against Republican candidate Dave Trott who was leading with 53 per cent votes.